Bridesmaids gifts can be such a fun and sweet way to thank all of the most influential ladies in your life for standing by your side on your big day! There are SO many generic gifts out there, so I wanted to share some fun gift ideas for the brides looking for something a little more high vibe. If you and your besties are into sage, crystals, essential oils, and bath bombs...look no further than Chasin' Unicorns. Check out some of my personal favorites below! And better yet, Chasin' Unicorns has agreed to give all of you 10% off ALL purchases with the code HIGHVIBEBRIDE. Cool stuff at a discount? Yes, please! 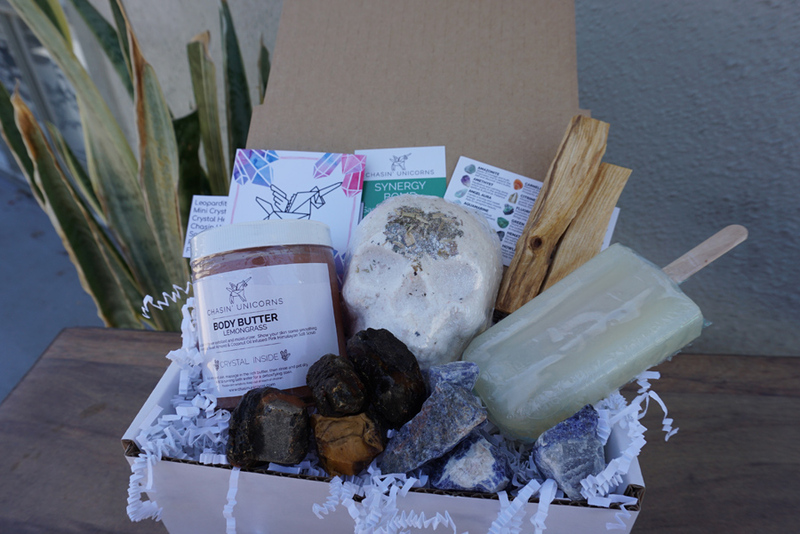 These subscription boxes take all the leg work out of curating the perfect high vibe gift! Every month is a fun new surprise. You get to try new products, save money, and get exclusive iitems from Chasin Unicorns and other handpicked high vibin' companies! Give your girls just 1 month, or maybe even a few month subscription! It's the gift that keeps on giving!